In the years since I began using the Fsc as an integral part of my designs, I’ve worried about why many who try the Fsc are having so much trouble with it. I might be part of the problem. Here I hope to be part of the solution. I do not claim to have invented this technique. The chainless foundation has been in use forever as one of the wonderful things you could pull out of your crochet bag of tricks if you knew about it. But I had never seen the Fsc specifically written into a pattern, even when the design would have been greatly improved by its inclusion. There was an incredible amount of editorial resistance in 2004 when I first dropped the Fsc bomb in my own design patterns. Resistance proved futile. 🙂 Resistance also equals V/I, depending on what sort of post you think you’re reading. At the time there was no standard published name for the technique. In the vacuum I gave it my own title (no, I did not name it after myself), Base Ch/Sc, because it makes a base chain and a row of sc in one pass. I did not want to use the word foundation in the name because to me a foundation row is the first pass of the actual stitch pattern which sets up the repeats upon which the fabric will grow. After a bit of scrambling among the members of industry’s elite corp of technical editors, one generally accepted title prevailed. This method of the chainless beginning of a piece of crochet is now known as Foundation Single Crochet (Fsc). The Fsc is one of many chainless foundations, elegant solutions to the problems inherent in the traditional chain start. I’ve written extensively about the beauties of foundation stitches, but haven’t addressed the major angst it has engendered among newbies to crochet and to the technique. One of the important aspects that I never thought to mention because it seems so obvious while you are crocheting it is that it comes out upside down. It has the feeling of making a long, skinny strip that is one stitch wide, and for those who are familiar with Tunisian crochet technique, it resembles the way the edge stitch is worked as you begin a return pass in TSS. The sc as you make them will not present themselves as a horizontal row going from the hook back to the start of the row the way normal rows look. This foundation will hang down from the hook, with the “chain” edge running on the forward side (in the direction of your work, to the left if you are a righty, to the right if you are lefty) and sort of on the top. The “sc” edge is running behind the hook (back from the direction of your work, to the right if you are a righty, to the left if you are lefty) and sort of on the bottom of the strip. Keep your eyes on the “chain” step of the Fsc. I tell people to physically grab the chain after you make it; pinch it and keep it relaxed and open so you can 1) find it for the following Fsc, and 2) work into it without struggle. Here is where some confusion has been generated. The “chain” edge of the foundation is on top and to the left. Working into the “chain” of the previous stitch under two strands means that you insert the hook so that two strands stay on top and to the left. You need those two strands to run across the “chain” edge of the Fsc to form the sturdiest, most elastic foundation. And still there is confusion. There is a variant to the Fsc that is often described and published side by side with my designs. The variant is made in almost the same way, but it leaves one single strand of chain at the bottom of each single crochet and this can compromise the sturdiness and elasticity of the foundation. Please look at these two foundations. On top is the one-strand Fsc variant. On the bottom is the 2-strand Fsc variant. This is the view from the RS (the side you’re looking at while you crochet it). This is the view from the WS (the back side of the single crochet). 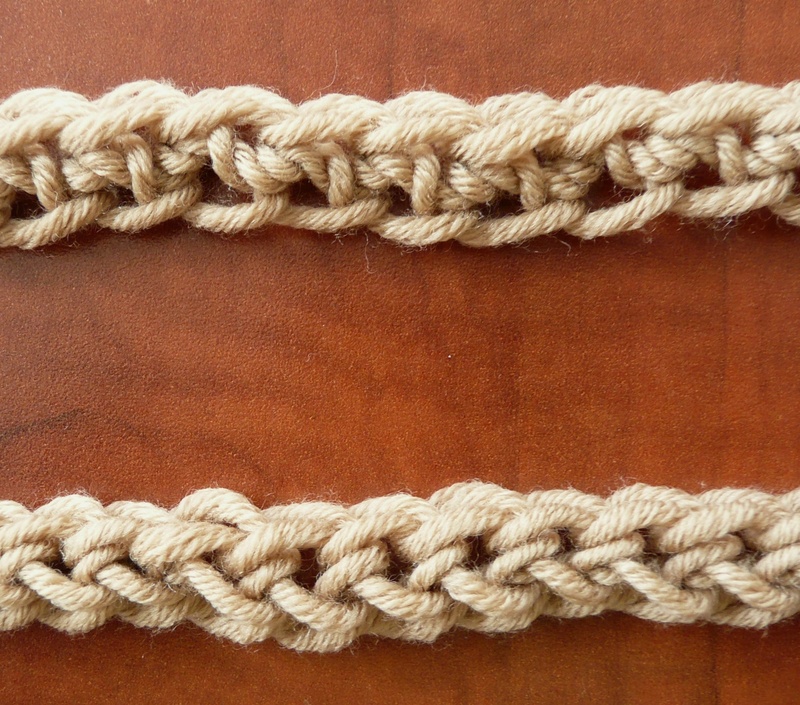 Both variants are named Foundation Single Crochet. For some applications it is not critical which one you use. But in some rare case where I specifically mention another method, ALL of my designs that use Fsc refer to the 2-strand variant. It may seem a small thing, rather trivial to you now, but trust me, it makes a world of difference in how the foundation behaves when you continue to work more crochet on both the sc and chain edges. So, in case you’ve been looking for an overwrought, obsessive account of how to do this useful technique, I’ve excerpted some stuff from my DJC Designs pattern, Birthday Girl skirt. It is written specifically for the beginning of a top down skirt, however the information can be generalized for working other types of projects in rounds (like top down sweaters) or worked flat without connecting into a ring. 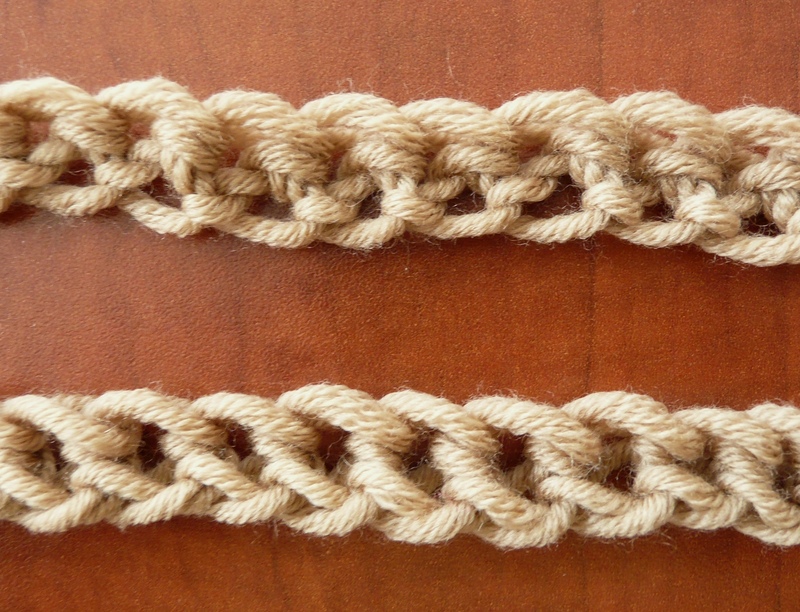 Fsc (foundation single crochet): This creates a beginning row of single crochet, each with its own chain at the bottom, for a sturdy, elastic foundation. Start with a slip knot, ch 2, insert hook in 2nd ch from hook, YO and draw up a loop, YO and draw through one loop on hook (the “chain”), YO and draw through 2 loops on hook (the “sc”). The following stitch is worked under the forward 2 loops of the stem of the previous stitch (into the “chain”). *Insert hook into the face of the “chain” and under the nub at the back of the “chain” (under two strands), YO and draw up a loop, YO and draw through one loop (the “chain”), YO and draw through 2 loops (the “sc”). Repeat from * for the length of foundation. — To work with Fsc as a ring, let the foundation hang vertically from the hook, with the sc edge running down from the last loop on hook (on the right if you are right-handed) and the ch edge running down the left. Making sure the foundation is not twisted, take the lower end (beginning end with the tail) and curve it up to meet the hook, with the sc edge on top, sl st in the beginning sc to form a ring. With the sc edge of the ring now on top, do not turn, start with first round of stitches. — This foundation has height. You have connected the stitches at the sc edge, but the ch edge is not yet connected. Eventually, whenever you get to it, at least before you go back and put the waistband on the skirt, thread the beginning tail onto a yarn needle and loop it through the last ch of the foundation to close the gap, weave in the end. There is one other caveat I can offer that might relieve some aggravation. In many of my top-down top designs, the foundation will not remain flat or straight. Don’t be upset when it becomes curved after laying on the following rows of stitch pattern. It is suppposed to curve. By squeezing more stitch pattern onto fewer foundation stitches you are giving a jump start to the increase shaping of the yoke and are on the road to creating the shoulder bumps that fit so nicely. For a more compete survey of the Foundation Single Crochet and other techniques, purchase and view the on-demand webinar, Chainless Foundations, now available at the Interweave Store. very good instruction and I love the stitch. Thank you. Thanks. This is much clearer than the book. I am attempting your “runaround” pattern and wanted to get this stitch down before I started with my project. My brother recommended I would possibly like this website. He was totally right. This publish truly made my day. You cann’t believe just how much time I had spent for this information! Thank you! When working the FSC as a ring, the tail end is much wider than the hook end. After joining with a sl st, It is difficult to join the tail end with a smooth, even joining. Do you have any helpful hints? I appreciate your interest in this technique, but I do not give individual tech support on this blog. It is not set up for this sort of exchange. Please join us at Ravelry.com, join the posse at the forum dedicated to my designs, Doris Chan: Everyday Crochet. You will be asked to sign up, but it is free. Once you are there you’ll find a wealth of information. Post your questions on the forum or try searching for answers there. Thanks for your understanding. I’ve seen the variations and did not like it. Doesn’t lay right or act right sometimes. I followed your tutorial for your version of the stitch and I LOVE IT ! I am totally sold on it…thank you for posting this ! I’ve been searching high and low and have only got more confused – this is the first that I’ve heard that there IS a difference, a 1 and 2 stitch variance; I couldn’t follow any instructional videos or books because they each do it differently, without saying so! Thank you for this post! Pingback: Five Handy Dandy Crochet Tutorials You May Just Want to Save for Later! Just wanted to say thank you, thank you, thank you, for explaining this technique in a way my brain understood (and the many sites I found first weren’t able to do this! ) now I understand this lovely stitch! Thank you! Thank you so much for the tutorial! I’ve tried a few times to learn this, been crocheting for 7 years now, and this was very informative and clear. =) I’m making some garland for my mini tree I just bought. You’re a genius! It finally makes sense. Thank you! This is very interesting and I’m going to give it a go. 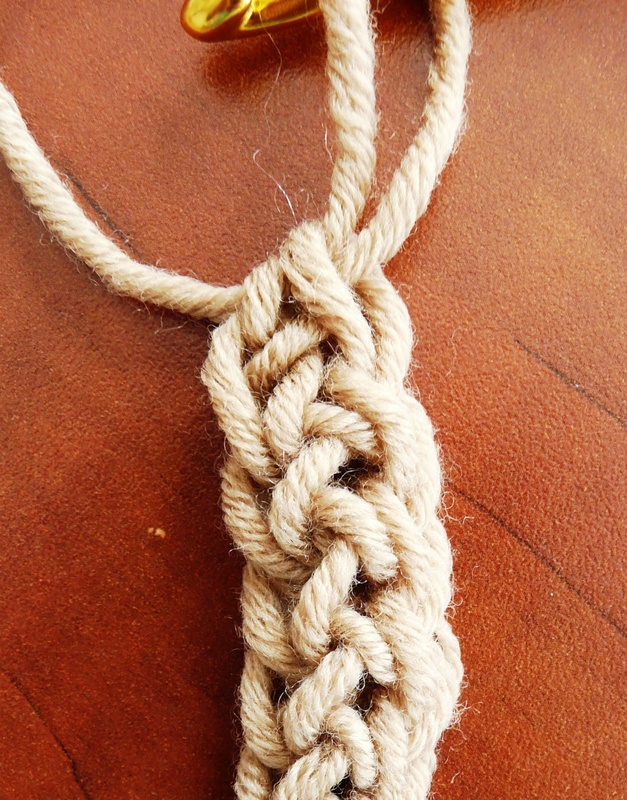 I especially like the idea of Fsc because I dislike making a chain and counting out all the tiny loops. I also find the first row into a regular chain difficult because there is little to hold on to, also the first row in regular foundation is easy to stretch the foundation chains. Thanks for your post!